Carcassonne , Klaus-Jürgen Wrede, Hans im Glück/ Rio Grande Games, 2002. Game review by Dan Becker, 2002/05/26. If you are a fan of Klaus-Jürgen Wrede's award winning game Carcassonne , it is likely that you will enjoy Carcassonne: The Expansion . This expansion set, which requires that you purchase the original game, add 3 novel twists which add to the variety of play and keep the original game fresh. For around $9, you get 18 new land tiles, some grey followers (more affectionately known as Meeples) to allow a sixth player, rules, and 6 new large followers. Just when you thought you were the Carcassonne master, the 3 rules will cause you to rethink your strategies. The first rules addition is the "Inn on the Lake" an example of which is shown on the tile at right. These six new tiles add a double-or-nothing wager to the completion of the road. If you complete the road it is worth double the normal scoring of one point per tile. If you do not complete the road, it is worth nothing. This is a welcome addition as it adds a bit of risk to road building, but it also makes road building more profitable. Suddenly a 5 tile road is more important than a cloister. An easy-to-build three tile road scores a not too shabby 6 points. In the games I have played, there have been some fierce battles to join in on some of the longer roads. A second rules addition is the inclusion of two "Cathedral" tiles. These tiles are played similarly to the existing 4 sided city tile, but the Cathedral tiles add a triple-or-nothing wager to the completion of the city. If the city with the Cathedral is completed, it will score triple points. If the city with the Cathedral is not completed, it will score nothing. This table shows the Carcassonne Expansion tiles. Since the smallest city with a Cathedral will be 5 tiles, the minimum score for a successful Cathedral play will be 15 points. Often, opposing players will join in the city, making it a very fierce battle for control. In several games of Carcassonne: The Expansion , I have seen a Cathedral city complete with about a 50% success rate. In all the games where the Cathedral city completed, it was due to the efforts of more than one player. Cathedral cities are certainly a focal point in the new game with most players trying to advance or repel the cause. In some games, the Cathedral city points may be larger than the total farming points, which often was the controlling factor in the original game. In a recent game, we had 5 of the 6 players joined in completing a 75 point Cathedral city dealing woe and misery to the one player who was not able to join in this magnificent achievement. 75 points! This score in itself is a respectable final score in a 5 player original game. While this score is unlikely, it does show that a big city may override the scoring efforts of an entire game. The final rules tweak is to give each player a larger Meeple. This follower counts as 2 followers for determining the ownership of a road, farm, city or other feature. This minor addition gives rise to several new strategies. For example, weaseling in on an existing city becomes quite deadly for the existing townies. The new high-powered Meeple can horn in and wrest control from weaker Meeples. The new super-Meeple is like a big thug that you can deploy to steal points. Since there is only one big Meeple per player, it does not radically alter the existing game, but it does provide a balance tipping alternative in certain situations. I only wish the new figure were a bit larger or a slightly different shape. I have seen many players place the big Meeple by mistake. Oh well, I guess true Carcassonne enthusiasts will pull out the paint set and make green hair, shocking pants, or Superman's S logo to distinguish the new piece. Finally, notice that there are 9 tiles which have no new features but are variations on the existing tiles. These include the two road Cloister, the four cap city, and other new road, farm, and city combinations. Even if you do not want to play with new rules, these feature combinations add variety to the existing game. My one minor complaint here is that the double cap city with road tile shown at left is graphically confusing. Doris should have made the bushes cover the intersection to show that both roads end. She also should have made the bushes touch the cities to emphasize that the farm is split, and the tiny roads to the city gates may not be occupied by a follower. Despite complaints with this one tile, the rest of the art fits perfectly with the existing game. The latest expansion tiles are well thought out and integrated into the game. This is in contrast to the 12 river tiles expansion which are now included in the game. I always disliked the river tiles , and I thought the "play these tiles first" rule delayed the start of the original game. The river tiles "must not turn back" rule lead to all sorts of confusion and debate among the players. Finally, since the river tiles did not change the scoring, it made the tiles somewhat useless in the final scoring. Little effect on scoring, added confusion: what fun do the river tiles bring to the game. In summary, Carcassonne: The Expansion is an inexpensive and worthy addition to the game. The new scoring situations situations are well balanced with the existing system. The new tile plays are integrated into the course of the game and not some special happening at the beginning. The new rules are easy to explain and have little ambiguity. 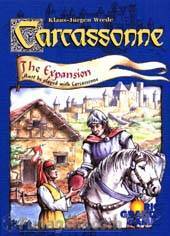 As the rules state, you may add as few or as many of the new features of the expansion as you like, and like a chef, you may concoct your own flavor of Carcassonne . In this respect, the expansion brings new seasonings to an older favorite. See the Lost Tiles of Carcassonne article. See the easy-to-print Carcassonne Expansion tile distribution. See the Carcassonne: Hunter and Gatherers tile discussion. Last modified: Thursday, 09-Jun-2011 12:36:38 MST.